The Pelican™ 1770 Case is in the Long Case category and is great for multiple rifles or longer gear. This is the perfect size between the 1700 and 1780. Fold down handles, easy open Double-Throw latches, and Automatic Purge Valve are standard features. And, the Pelican™ 1770 Case is stack-able for convenient storage. And you’ll know it’s a Pelican™ by the distinctive dual band design. The Pelican™ 1770 Case has transport wheels for better handling. 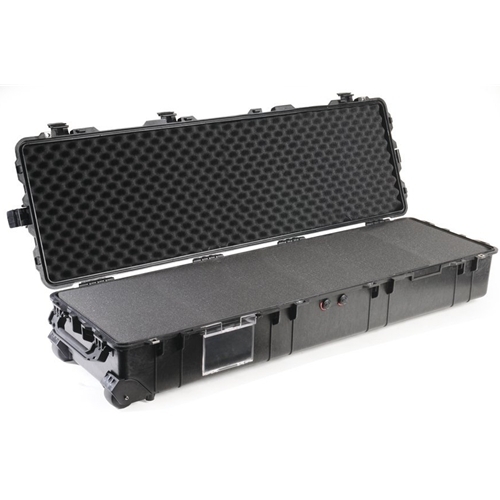 Your equipment can fit into the high density foam of the case for total subjection and protection against impact, vibration or shock. A nameplate (included) can be personalized (engraved at additional cost). Perfect for the Ultimate Outdoor Hunter gun case. You can rest assure with this Pelican™ 1770 Case your shotgun, rifle or handgun will be protected while traveling on the airline, ATV or in the back of the truck.